He showed up Christmas morning. For several weeks I’d been seeing a sickly squirrel in the back yard, eating the sunflower seeds with all the other squirrels. He was missing a lot of fur, and I could tell he was not well. I worried about how long he could last in our cold, wet Oregon weather. 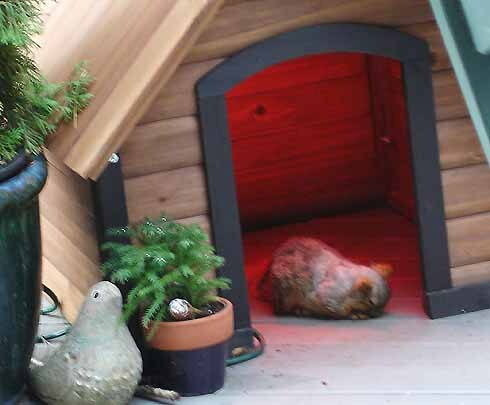 Last month I installed a heat lamp in the house I keep on the deck for Sammy, the outdoor cat I’ve been feeding for over 7 years. I’ve never been able to get near Sammy, and he doesn’t stay in my yard for very long, but he comes just about every day for food. 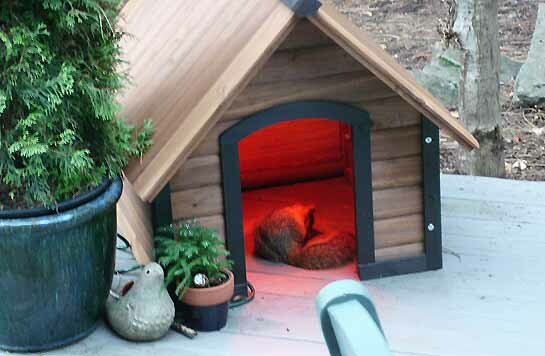 I suspect he’s enjoying the heat because from time to time I’ve found him snoozing in his warm house. However, on Christmas morning it was the squirrel, and not Sammy, who found refuge in the heated house. The little guy spent several hours in there, constantly turning to get his entire body warm before he would step outside for a quick cool down. Then it was back into the house. Eventually he jumped off the deck and ran under the fence, perhaps off to a Christmas breakfast or some other important holiday event. I will be forever grateful to this little squirrel, for watching him find comfort in the heated house brought me peace this Christmas…and that was the best gift I could have received.